Today Is Valentine’s Day. Do You Know Why? Ahhh, Valentine’s Day. The day couples express their love, and single people wish all those dang couples would just burst into flames. It’s also the one day of the year no one will look at you funny if you eat chocolate for breakfast. And lunch. And dinner. My boyfriend and I don’t get to spend a whole lot of time together (a different story for a different day) so when he said he’d drive the thirty minutes to come see me at my office, I was thrilled. It may not seem like much, but given the price of gas these days and the fact that after we had lunch he was turning around and driving two hours to one of his classes, I think it’s wonderful. I would have been perfectly satisfied just with that, but he stepped it up a notch. When he arrived at my office and I walked to his car, I could see there were flowers in the front seat. I opened the car door and there on the passenger seat was a beautiful bouquet of long stemmed red roses with a Star Gazer lily in the middle. I love Star Gazers. LOVE them! It made me so happy, I couldn’t stop smiling. Oh, lunch was really nice too. 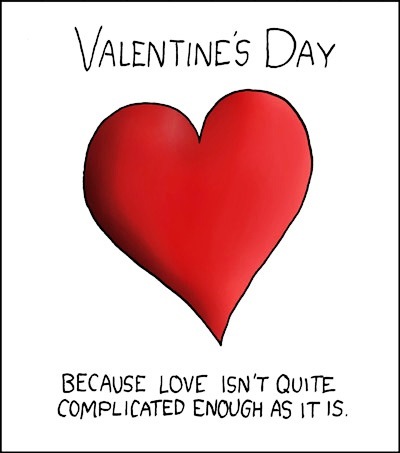 You may not know this, but Valentine’s Day wasn’t actually created by Hallmark, or the chocolate industry. No, really! St. Valentine’s Day, as we know it today, contains vestiges of both Christian and ancient Roman tradition. So, who was Saint Valentine and how did he become associated with this ancient rite? Today, the Catholic Church recognizes at least three different saints named Valentine or Valentinus, all of whom were martyred. One legend contends that Valentine was a priest who served during the third century in Rome. When Emperor Claudius II decided that single men made better soldiers than those with wives and families, he outlawed marriage for young men — his crop of potential soldiers. Valentine, realizing the injustice of the decree, defied Claudius and continued to perform marriages for young lovers in secret. When Valentine’s actions were discovered, Claudius ordered that he be put to death. Other stories suggest that Valentine may have been killed for attempting to help Christians escape harsh Roman prisons where they were often beaten and tortured. According to one legend, Valentine actually sent the first ‘valentine’ greeting himself. While in prison, it is believed that Valentine fell in love with a young girl — who may have been his jailor’s daughter — who visited him during his confinement. Before his death, it is alleged that he wrote her a letter, which he signed ‘From your Valentine,’ an expression that is still in use today. Although the truth behind the Valentine legends is murky, the stories certainly emphasize his appeal as a sympathetic, heroic, and, most importantly, romantic figure. It’s no surprise that by the Middle Ages, Valentine was one of the most popular saints in England and France. previous post: Farrah Fawcett’s Son Arrested. Again. next post: Was Sam Lutfi Britney’s Svengali? 48 queries in 0.619 seconds.